In this article, we'll outline the FIVE things you must do if you want your website to generate leads. If you follow these steps you're guaranteed to see an improvement in the traffic and leads you get from Google™ and the other search engines. What's not to like. We've written a lot about how to create profiles of your ideal customers. In marketing speak, these are usually referred to as buyer personas but let's stick with ideal customers as it's much clearer. Your ideal customers are not everyone, this is a rookie mistake and it's lazy, you really have to dig a little deeper, fine-tune your thinking and develop profiles of your two or three truly ideal customer types. If it helps, go through your customer database and think carefully about the people in it. You're pretty much guaranteed to figure out most of them can be categorised in a way that will help you understand them better. The insights you'll gain by doing this will really help your business because you'll get to know which customers are worth the most to you. Once this has been done you're ready for the next step. With a deep knowledge of your ideal customers, you're sure to develop a great understanding of the problems they're trying to solve. This is worth spending some time on. For example, if you sell cars what problems do your ideal customers have? Is it as simple as needing a new car? I doubt it. The problem someone in the market for a new car is trying to solve is more likely to be related to affordability, economy, acceptable running costs, interest in the environment and so on. If your website just says things like "we sell cars" or "buy cars from us" you're missing a trick. 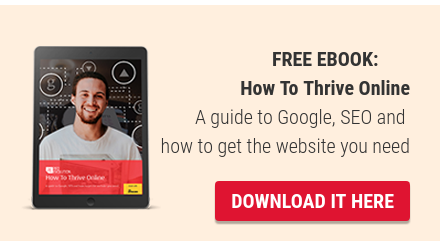 You simply must develop a solid understanding of the problems your ideal customers need answers for and establish what they're typing into Google™ looking for the answers. This leads us on to keyword research. Tools like SEMRush and others make it really easy to establish what your ideal customers are searching for, the actual words and phrases they type into Google™. You don't need to and should not guess this stuff, do the research and if you're not sure here's a keyword research primer that will have you finding keywords like a professional in no time. All too often I hear people say things like "I reckon people searching for our services type xyz into Google". Stop that right now, it's the wrong approach. Don't use guesswork. Tools like the one mentioned above make it very easy to investigate your competition. It will show you how much search engine traffic they get, what they rank for, what paid search terms they bid on, who's linking to their website and so on. I mention links because links are a vital part of search engine ranking but one of the most challenging. Here's a solid overview of the importance of link building. An intimate knowledge of your competitors also helps you pick your fights, let me explain. Let's say you establish that a certain keyword would bring the right kind of traffic to your website. By investigating your competitors you can establish how hard, or otherwise, securing that ranking might be. If you were a small retailer and the research showed you were going head to head with Amazon and other big brands you might want to reconsider your approach. It's really easy to quickly develop an understanding of your competitors and the market you're in. This work also feeds into the final stage in this five-part program, your content. The, for some, inconvenient truth with web-based lead generation is the fact it's driven by top quality content. This is because your customers are looking for credible information when they're researching solutions to the problems they've got. A website containing nothing but a sales pitch, buy service X or product Y here, is not going to cut it for most businesses. It might work for Amazon, it won't work for you. It's likely blogging will play a part in this endeavour and although very powerful, it's much misunderstood. We've written a great overview of the purpose of a blog so if you're floundering it will certainly help you. Other forms of content you use might include e-books, white papers, videos and infographics. In short, your content needs to educate and inform without being overtly sales orientated. The theory is, if you educate and help people you might be seen as an authority and this could lead to an engagement. The best approach is to create a three-month content calendar so you know what you need to create and when you need to create it. Be disciplined, follow your plan and as you get into month three create your next three-month plan based on what's worked best in the current three month period. If you get into the habit of creating fab content on a regular basis you will get more traffic and more leads from search. It can seem daunting when you start out on this journey. There's usually a mountain to climb and it's easy to decide not to bother. Don't be one of these people, leave being defeatist to your competitors. At first, progress might be slow but as you start to see traffic and enquiries build, you'll know you've done the right thing.